Weber Shandwick’s crisis management work for Michigan State University (MSU) has come to light, dealing a blow to the industry’s reputation—and raising questions about the agency’s client-vetting process. A story published yesterday by the Lansing State Journal detailed the media monitoring work the New York-based agency performed for MSU in the wake of the Dr. Larry Nassar sexual assault scandal. The work—which included the monitoring of traditional media coverage on social media as well as the accounts of Nassar’s victims—cost MSU more than $500,000 for the month of January. 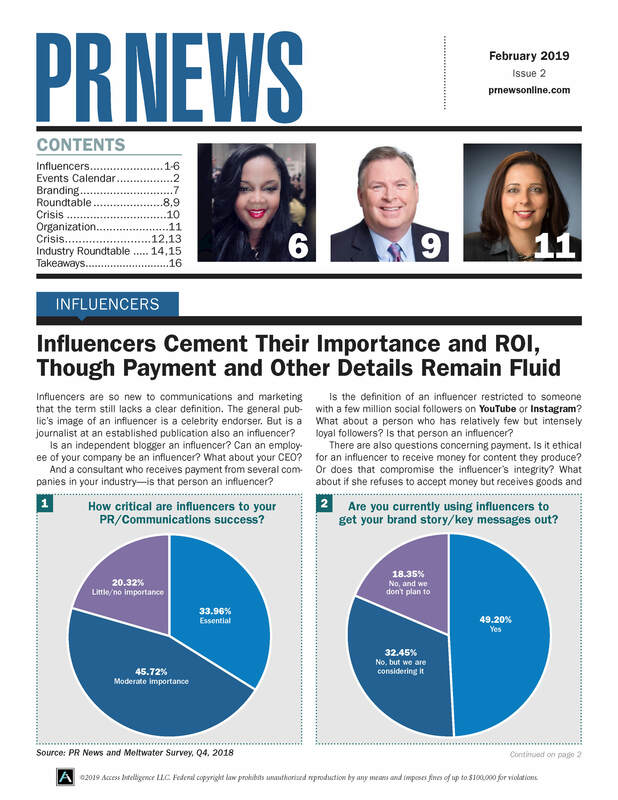 In a statement provided to PR News, the agency said that while it usually doesn't comment on client assignments, it wanted to set the record straight in light of inaccurate mainstream news coverage. "The majority of our work involved crisis counsel to address the tragedy. We were not hired to monitor victims’ social media accounts," the statement read. "As with any assignment, we forwarded to our clients traditional media and publicly available social media pertaining to the horrible tragedy at MSU, including statements made online by the victims. The victims were and continue to be the most important voices in the conversation." While the price tag is raising some eyebrows, the real question for PR pros is: What should agencies do when they consider taking on a controversial client, particularly in the age of #MeToo? The agency is being hammered today in the court of public opinion, which should give pause to other agencies who may be considering doing work for a controversial potential client. One takeaway for communications pros is to always be mindful that every electronic communication you generate could end up in a journalist's hands. 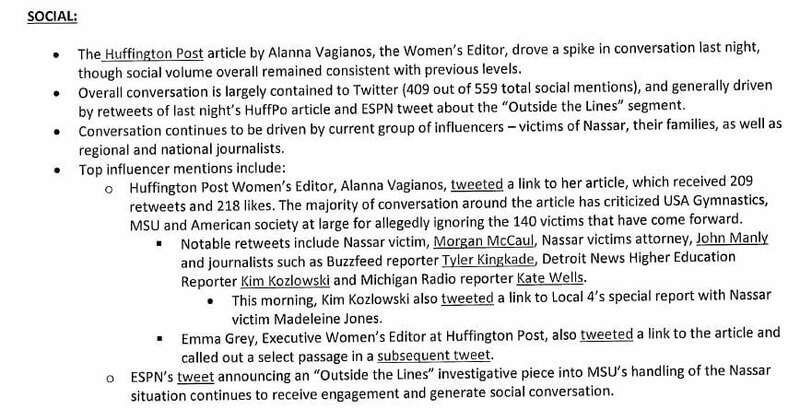 Beyond detailing the price tag, the article included screen shots of emails sent from Weber Shandwick to MSU, including the one below, which characterized the victims and their families as influencers. Weber Shandwick started working with the university last December through a third-party, when the school's law firm Skadden, Arps, Slate, Meagher & Flom and Affiliates retained the agency to help with PR and media issues. Weber Shandwick stopped working with MSU in early March, having put in its 30-day notice in early February. But the work the agency did lingers on. Aside from the hit to Weber Shandwick's reputation, the story also casts the entire PR profession in a negative light. The news comes fresh on the heels of Hope Hicks’ confession that she sometimes told “white lies” during her work as President Trump’s communications director. In a story about Hicks, L.A. Times columnist Virginia Heffernan asserted that “…lying to the media is traditionally called PR,” prompting a stern rebuke from PRSA chairman Anthony D’Angelo. And last year, British PR agency Bell Pottinger folded after its work for controversial clients such as Oscar Pistorius, the wife of Syrian strongman Bashar al-Assad—and most notably, the Gupta family of South Africa—came to light. The agency’s work for the Guptas included a social media campaign whose goal was to exploit racial tension in South Africa to further its client’s agenda.